For the longest time, I was aware of Dr. Peter Marzio – the director of Houston’s Museum of Fine Arts, who died yesterday at age 67 – without actually meeting him. As the editor of ArtsHouston and now of Houston ArtsWeek, I certainly found myself at receptions with him across a crowded room. But I never had or found a reason to say hello until two writing assignments forced me to do so, in what proved the final months of his life. Three months ago, I sat down with Marzio in his office at the museum and reflected on his long career in Houston in a line of work not known for longevity. He seemed dazzlingly well-dressed and perfectly groomed, and definitely tanned. There was nothing about the man that made me think he was going to die before the new year. And then I caught up with him by phone less than a month ago, for an article in the current Houston Magazine. For the longest time, Marzio explained to me in his office that afternoon, art museums in the western world used their collections to, essentially, pay homage to themselves – to the forms and functions of art as defined by the West, as well as to those handful of ancient cultures thought to have made such art possible. In the 28 remarkable years he served as director of MFAH, the world of art has changed dramatically. And often as not, Houston has been out front, leading the way. 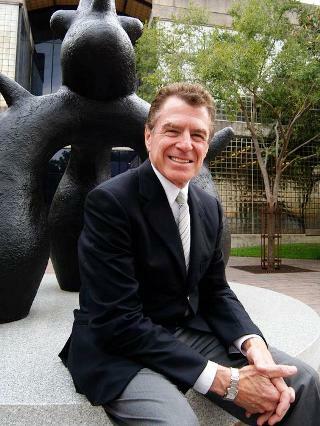 Those were 28 remarkable years for MFAH and for Marzio himself, not least since the typical tenure of a museum director is about four years. Still, this “28” is only one of the numerals that have attached themselves to the period. Under Marzio’s leadership, MFAH annual attendance increased from 300,000 to 1.6 million and memberships from 7,000 to more than 40,000. The operating budget exploded from $5 million to $52 million, the endowment from $25 million to $1.1 billion, and the permanent collection from 20,000 to 63,000 works of art. It may be tempting, after seeing too many movies, to picture an art museum as a single huge marble building filled with paintings and sculpture. This is part of what MFAH is today, and certainly part of what it was envisioned to be when it opened its doors as the Public School Art League, the first art museum in Texas, on March 24, 1900. Over the century-plus that followed, though, it has become a multi-faceted setting and multi-layered operation, with not one but two gallery buildings: the Audrey Jones Beck and the Caroline Weiss Law. Other pieces of the puzzle include the Lillie and Hugh Roy Cullen Sculpture Garden; two house collections, Bayou Bend Collection and Gardens for American decorative arts and Rienzi for their European counterpart, and the Glassell School of Art. More recently, in that phone interview for Houston Magazine, I talked to Marzio briefly about the arts initiatives of the museum’s close neighbor, Rice University. I’ve always hated asking people about efforts that weren’t their own, especially since long years as a reporter have taught me that most people prepare to talk about themselves, what they’ve done and what they’re doing. Marzio, however, responded with unusual grace and generosity. Now, only 24 hours after Marzio’s unexpected death, anyone speaking with grace and generosity in his honor would say the same about him. A few years before her unexpected death to lymphoma at age 55, playwright Wendy Wasserstein gave birth to a daughter – an act of love and hope for the future, and also a profound case of life imitating art. 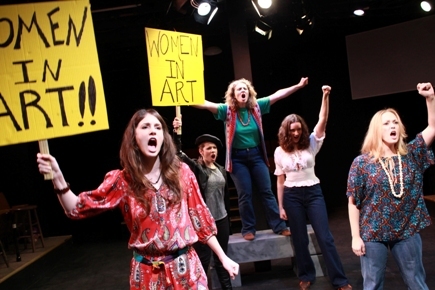 Shortly before the end of her Pulitzer Prize-winning play now showing at Main Street, the title character adopts a daughter in the waning days of the women’s movement that ravaged the ‘60s and ‘70s, expressing the hope that things will be just “a little bit better” for her than they were for previous generations of women. That rather modest hope speaks volumes about the pilgrim’s progress of The Heidi Chronicles, a play that does a Forrest Gumpian job of capturing the highlights and lowlights of a quarter-century of American social history. And while the play’s sense of that big picture is accurate and absolute, it’s the very personal nature of Heidi’s story that makes it work onstage – even now that some parts of the tale seem outmoded while others, thanks to the sacrifices of women like these, are taken for granted. Honestly, there’s virtually nothing you can say about the changing roles of women in modern life that isn’t echoed somewhere in The Heidi Chronicles; most issues, in fact, are attacked dead on. With plenty of humor, pathos and a proper dose of uncertainty, Wasserstein is able to portray the birth of today’s woman not as a sociology thesis but as an intensely human journey. 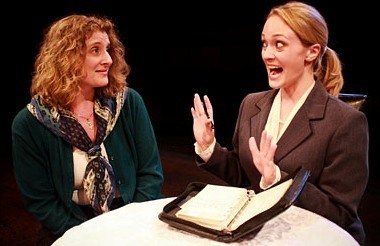 Cheryl L. Kaplan portrays Heidi Holland with conviction and a delightful lack of bombast. At no point in her portrayal does she seem particularly above it all, or “larger than life.” She hopes, she dreams, she struggles – she advances, then stops at regular intervals to wonder if she’s advancing at all. As was and is so often the case, her career (as an art historian specializing in women artists who were overlooked) seems a greater success than her personal life. She’s single when we say hello to her in high school in 1965, and she’s still single when we leave her to rock her baby on the brink of the 1990s. Intimately woven into the story of why and how Heidi is single is the show’s most brilliant touch. For lo and behold, in a play “about” the women’s movement, it’s Heidi’s relationships with the two most important men in her life that drive a lot of the action and produce a lot of the deepest emotion. Both men are archetypes done exceedingly well, though both dangle in the direction of cliché. Ever-cynical journalist Scoop Rosenbaum (perfectly embodied by Justin Doran) is the guy every woman falls for at least once: the tall, good-looking, witty and unapologetic cad. And pediatrician Peter Patrone is his bookend, another piece of many modern women’s lives: the smart, charming, compatible-to-hell-and-back guy that everybody thinks she should marry, except he’s gay. David Wald delivers what may be the production’s best, and definitely most endearing, performance as Peter, living through a liberation movement of his very own along the way. 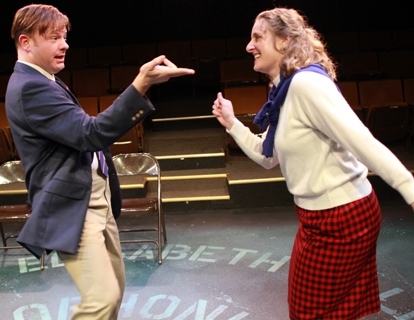 The direction by Main Street executive artistic director Rebecca Greene Udden makes the most of Wasserstein’s lightning wit. Whether we’re watching Heidi in different forms of repartee with Scoop or Peter, or talking about life with her long series of women friends, or having a funny-heartbreaking near-breakdown during a talk about the status of women today, we never want for anything here. Entertainment is constant, as are ideas we can think about as much (or little) as we care to later. As evoked in The Heidi Chronicles, the women’s movement suffers from the same interweavings of contradiction, exploitation and ambiguity as any other liberation movement throughout history. But no one walking out of Main Street Theater after the show can doubt for one second that Heidi’s hope for her daughter is well-founded. Photos by Ric Ornel Productions: (top) the women’s protest march; (middle) David Wald and Cheryl L. Kaplan in high school; (bottom) Kaplan and Jen Lucy in LA in the the ’80s. At first glance, Craig Lucas’s comedy-drama Reckless seems another of those quirky, modernized, very American Christmas stories. And in some ways, even beyond that first glance, it is. Rachel, the tale’s main character, loves Christmas. Always has and always will, even if she’ll change her name and location more than once before the play is through. Indeed, it is a lovely Christmas Eve filled with soft-drifting snow when the lights go up. The two unseen children are snug in their beds. And Rachel is sharing with her husband Tom just how happy she is this particular holiday season. That, naturally, is before Tom confesses he’s hired a hitman to break in and kill her. In Brave Dog Players’ rendition, now on display at a brand-new space on Post Oak called Wildfish Theatre, that’s when Rachel goes out the window, accepts a ride into the icy night from a stranger (who’s already living a made-up life under a made-up name) and begins the long journey into her future by way of her past. Or just maybe, vice versa. Brave Dog was founded earlier this year to present plays that the company’s four principals didn’t think were produced enough by Houston’s large, larger and largest theater troupes. John Cariani’s Almost, Maine was their debut production last Valentine’s – and it seemed the perfect quirky love story, complete with its own snow – to launch an alternative venture. And now Reckless is the perfect followup. Three of the four founders are hands-on in this production. Longtime Alley favorite Philip Lehl serves as director, something he made his local debut doing with Almost, Maine. He keeps things lively throughout, finding logical and, best of all, unintrusive ways to use the small stage and minimalist set to let the story and characters stand out. Though we hope Philip never gives up acting, we think he has a promising future as a director too. One Brave Dog founder, Georgi Silverman, is missing from the stage, having recently given birth to a third child. Her husband, Rick Silverman, is there, however, playing two of the evening’s most memorable roles: the effete and lispy director of a charitable organization and the wild, leering host of a TV game show. And that leaves the fourth founder, the director’s wife, Kim Tobin-Lehl. We’ve seen Kim in a number of productions, and she brings all of them to bear on her Rachel. Joy, sorrow, fear, guilt, longing, all behind a mask of confusion that is the signature of modern life. Though the story of Reckless is, in general, outlandish, the character of Rachel is real, credible, just plain likable. We buy into this weird semi-Christmas odyssey because we care what happens to her. Several players round out the Brave Dog roster for Reckless: Kregg Dailey as Lloyd, the man who gives Rachel a ride on that Christmas Eve and ends up, along the road of life, living in a Santa suit; Zach Burton as Rachel’s husband Tom and, much later, as someone else dear to her heart; and Susan Draper as the wheelchair-bound paraplegic “deaf girl” ridiculously called Pooty. Julia Traber masters the secretary-scowl as Trish, while Candice Meade changes personalities and accents before our eyes to play six different psychiatrists. We might need to see at least one after all this. Brave Dog has gone all out on talent if not on money when it comes to production values. Kevin Holden dishes up a wonderful set, mostly a single backdrop of hanging household items that takes on colorful projections around two flat-screen TVs, while Jodi Bobrovsky keeps costumes realistic. Chip Schneider needs to be singled out for his music and sound design, not that we typically notice such things. The use of Christmas carols, in unexpected and often ironic ways, turns some of the world’s most familiar melodies into a kind of Greek chorus. TV news reports and changing radio stations really do help push the adventure along. At Wildfish Theatre through Dec. 19. www.bravedogtheatre.com. Photos by Gabriella Nissen: (top) Kregg Dailey and Kim Tobin-Lehl; (middle) Kim Tobin-Lehl and Julia Traber. An organization calling itself Divas World is presenting Divas Café, a new concert series that celebrates the passion and talent of the singer/songwriter. The series will premiere with Weave: The Art of the Songwriter on Friday, Dec. 10 at 7:30 p.m. at Nouri Gallery. Featured guests performing throughout the evening include composer Danny Ashkenasi, singer/songwriter Tricia Fox, and flutist Jennifer Keeney. Divas World artists rounding out the evening include Anita Kruse, Ray Younkin, Aaron Kaufman, Rodney Waters, David Laduca, Sonja Bruzauskas, and Kenneth Gayle. Weave: The Art of the Songwriter will uncover the passionate poetry of the songwriter through an intimate exploration of original and popular songs. In the tradition of the Divas Salon series, this Divas Café performance will also include readings and prose that complement the Weave theme. The evening will feature poet Ava Leavell Haymon, who will facilitate an insightful audience discussion at the conclusion of the concert experience. This Divas Café concert is free and open to the public. Seating is limited and is available on a first-come, first-served basis. Doors open at 7:00 p.m.; the performance begins at 7:30 p.m. Nouri Gallery is located at 3001 Richmond Avenue, between Buffalo Speedway and Kirby. Divas World is a non-profit performing arts organization dedicated to inspiring audiences through intimate and engaging performances that deepen the relationship between intellectual thought and music. In the tradition of the European Salon style of music, performances are interactive, highly creative, and incorporate other art forms such as philosophy, history, and science in order to achieve a more meaningful experience that taps into everyone’s innate artistic passions. 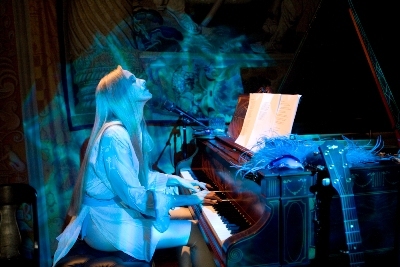 Through the generous support of donors and patrons, many Divas World performances are open to the public, free of charge. For more information, visit www.DivasWorld.org.